Situated in a quiet, tucked away position between Rustington village shops and the seafront is this attractive three, bedroom bungalow. 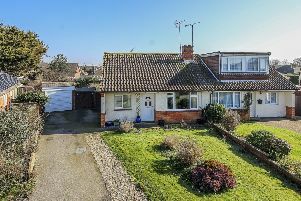 The property, in Green Bushes Close, offers plenty of space with easy-to-maintain gardens, and is presented in good clean decorative order throughout. Accommodation comprises an entrance hall, lounge, dining room, kitchen, three bedrooms and a bathroom. Outside, the front garden is paved for ease of maintenance with a driveway leading to a garage. The rear garden is also paved with a potting shed and further shed. Green Bushes Close is a quiet cul-de-sac well positioned in an extremely sought-after location with convenient access to both the seafront and Rustington village. Rustington offers a great range of popular restaurants, cafes and pubs, as well as a good choice of independent shops together with a Waitrose and several other well-known High Street brands, including Iceland, WH Smith, Tesco, Next and Sainsbury’s.